The Internet, fronted by charismatic vocalist Syd, lock into grooves so complex and soothing that it’s hard to find fault with the similarities between new album Hive Mind’s songs. 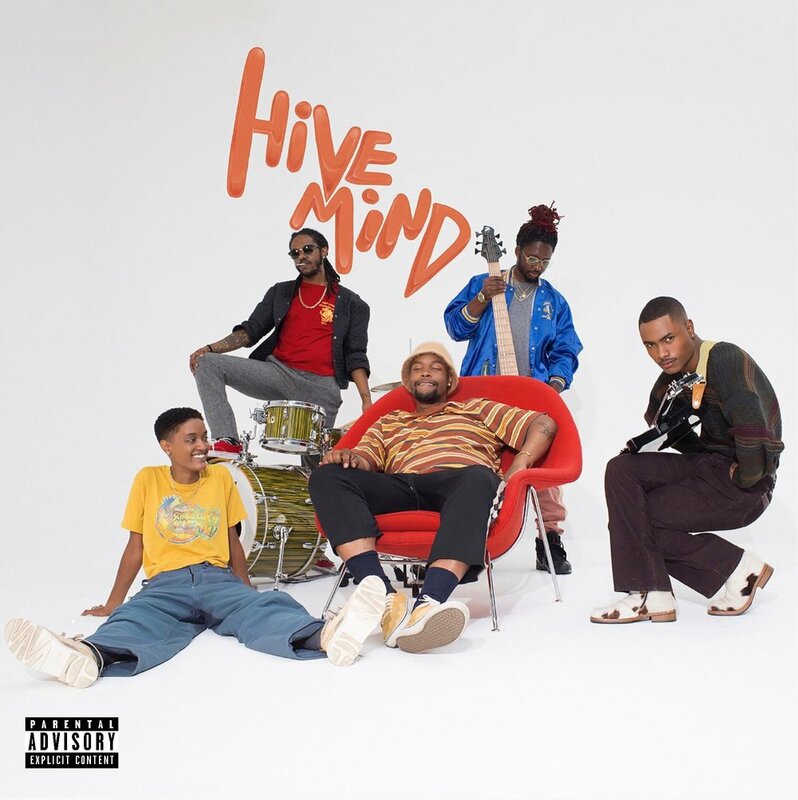 Hive Mind, the latest album from Odd Future offshoot The Internet (7/20/2018 via Columbia Records), is full of bass-driven grooves and fantastic vocal work from Syd, who fronts the group. It plays to their strengths, especially showcasing member Steve Lacy’s funky guitar and production work, without really detracting from rhythm, melody, or song structure. The album’s title, especially fitting in the wake of their previous record Ego Death, conveys the degree to which the band works as a single unit here, despite the fact that Lacy and Syd seem to have handled the bulk of the songwriting. Swirling guitars, courtesy of Lacy, glide over a thunderous trebly bass line on the LP’s opener, “Come Together.” Everything about the record projects unison—between instruments, members, and diverse influences — and this track functions as a good introduction to the cohesive project that follows. Syd’s dreamy high-range vocals about getting high and living life aren’t her most meaningful to date, but she complements the complex instrumentation in a way that highlights every member’s contributions at once. Lead single “Roll (Burbank Funk)” makes use of electronic drums and similar instrumentation, and its catchy chords conceal the fact that, for all intents and purposes, the track sounds strikingly similar to “Come Together.” This record is remarkably consistent, to be sure, but as “Burbank Funk” makes clear, that’s partially due to The Internet’s use of one main sound throughout the album. Which is not to say that “Burbank Funk” is not a fantastic track, because it is, but it is also a good example of how such a “hive mind” can be dangerous for such a large group. “Come Over” finds the group treading some different territory, with Lacy’s clanging guitar accompanying the syncopated drumming. Syd’s sexually uninhibited lyrics add a more personal flair to the track, too: “If you just love me, come over,” she sings in the refrain. “La Di Da” pushes Lacy into Nike Rodgers territory, with a flanged-out guitar providing the main chord progression underneath Syd’s baritone register. Lacy also provides vocals in the chorus, and their disparate voices work together to create irregular harmonies. The band migrates away from up-tempo funk on “Stay the Night,” one of the album’s more tender moments. Syd’s introspection steals the show on this track, and while the bass line and guitar work are impressive, it’s tough to distinguish them from some previous tracks. A beautiful, classically inspired guitar solo, however, reveals just how broad some of this group’s influences are, and demonstrates how well they can merge wildly different sounds. Echoed and reverbed drum hits begin “Bravo,” which pits Syd’s vocals against a chromatic bass part, and while it makes for a lovely contrast, the song does not necessarily develop beyond its initial, individual elements. “Mood” starts roughly the same way, but it’s less aggressively dream-like, and finds Lacy pushing himself to the greatest lengths to compose a lovey backing guitar track. A jazzy outro saves the track from the same fate as “Bravo” and makes it clear that the band works best when the members push themselves to develop songs beyond just the admittedly intriguing instrumentation of the opening seconds. “Next Time/Humble” takes a cue from “Mood” and is actually a fascinating, dynamic work of contemporary R&B, Syd’s voice flying from high to low registers to accompany the shifting melodic content. Synthesizers straight off of Flower Boy anchor the track’s first half before launching into space-age funk. “Humble” is one of the album’s highlights, and especially coming after “Next Time,” it sounds organic and carefully composed. Syd’s voice sounds like honey, slow-moving and thick, but sugary, sweet. The production here is stellar, almost arresting — if you can only check out one track on the album, this may be the one. “It Gets Better (With Time)” is the other track that is a necessity, and the band’s groove here is more constantly-evolving than on any other track. If the first half of the album sounds too same-y at times, this is where The Internet’s instrumentation shines. Rap verses from the group’s bassist, Patrick Paige, and guest Big Rube toward the end of the track seem like a no-brainer, likely prompting some listeners to wonder why there isn’t more rapping on Hive Mind. It fits so perfectly, and makes for a nice break from Syd’s intense, captivating voice. “Look What You Started” is a funky jam, a more unusual-sounding version of some of the record’s early tracks, that soon fades into the ’90s hip-hop stylings of “Wanna Be,” which sounds like it could be Lauryn Hill collaborating with, well, The Internet. Or at least with Steve Lacy, at any rate. The song intensifies over time, toeing the line between R&B and funk even more closely than on other tracks. The record closes out with the 1-2 punch of “Beat Goes On” and “Hold On,” the former of which finds several non-Syd members (Lacy and multi-instrumentalist Matt Martians) handling vocal duties over hypnotic instrumental work, chanting that “the beat goes on” until it shifts abruptly into a wordless, jazz-tinged outro. For “Hold On” the group rolls out all of its stops, with beautiful guitar and keyboard melodies grounding Syd’s melodically ambiguous lyrics. The track is a perfect conclusion to an impressive record, and while it suffers the same repetitive fate in some ways, it makes a strong case for The Internet being one of the biggest groups to watch out for in hip hop and R&B—a 21st century, Tyler, the Creator-style Roots, of sorts.